Directly from beautiful, sunny Sicily, here is a fabulous recipe for pesto with almonds, tomatoes, basil, garlic, olive oil and pecorino cheese. All the aromas of the Mediterranean on one plate ... aromas and flavours that are perfect for combining with fresh, homemade pasta or, if you like, to spread on some toasted bread to make bruschetta, the result will be 10/10 and will leave your guests open-mouthed in awe! 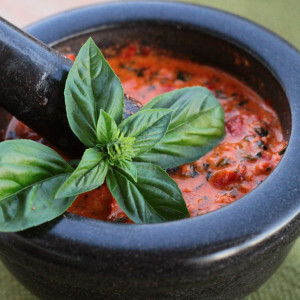 Sicilian pesto is a variation on the classic pesto sauce, replacing the pine nuts with almonds and adding tomatoes, thus adapting to the traditions and produce of the Sicilian region. To make this fabulous pesto, just follow this delicious recipe and within minutes you'll have a wonderful sauce to go with your pasta, and make a great impression to boot! Read the visual recipe from our chef carefully and everything will go without a hitch. Finely crush the almonds and garlic together in a mortar. Then add the basil and a drizzle of olive oil and pound together well. Add the grated cheese and mix in well, then add the tomatoes. Salt lightly and emulsify with plenty of oil. Pesto, if not used, can be kept in the fridge for up to two days, or you can freeze it immediately after it’s made by putting it in small plastic cups such as those used for espresso, to be used as and when needed. In this way you can make a large quantity so there’s always some at your disposal. Basil is an herb which is, of course, widely used in the kitchen but it can also be useful in other areas. For example, phytotherapy and aromatherapy; its essential oils can be used to make mouthwashes to prevent and combat oral infections; it's a remedy against mosquito bites - you can get relief by rubbing the leaves on the bite; and finally, it repels flies.